Ever wanted to jump all night long at Sky Zone? Now you can! 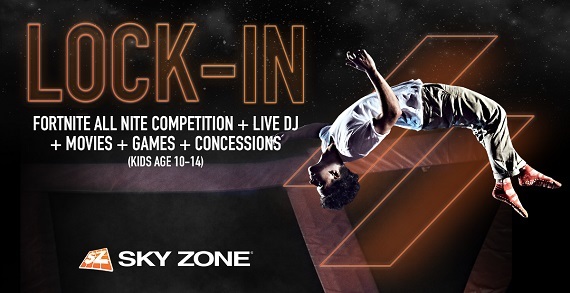 Come to Sky Zone's Overnight Lock-In on Saturday, 10/13 from 10pm to 6am. Sky Zone is the world’s first trampoline park. Sky Zone is the inventors of “fun fitness” and the makers of trampolines as far as the eye can see. They give you one of the greatest workouts ever combined with awesome, healthy fun. Sky Zone has been voted the number one “out of the box” workout and the “best party ever.” Experience WOW – the weightlessness of bouncing, flipping and landing in a pit filled with 10,000 foam cubes. Sky Zone is dedicated to providing you with the pure joy that comes with flying. They are sky lovers, thrill seekers and people who believe that jumping is freedom. They believe fitness can be fun and play can be smart. They are healthy and bursting with energy. They fly high and keep it safe. They are Sky Zone. Sky Zone Columbus was the very first franchise to open up in September of 2010, and offers open jump, SkyFit fitness classes, Ultimate Dodgeball and a Foam Zone. For just about any age, shape or size, Sky Zone Columbus is the ultimate 3-D play experience! Sky Zone is always working to invent epic new ways to play, gather, and compete. Even though they’re the originators of wall-to-wall aerial action, they never stand still. The only way to understand it is to come experience it. So rally your crew and let’s go! Have your next party at the place voted Best Birthday Party Venue by Columbus Parent readers for five straight years and Columbus Monthly readers for two straight years! Ready to take your next birthday party to the SKY? Sky Zone offers a birthday party package to make your party soar, literally! For a unique and memorable birthday party, bring your group to Sky Zone Trampoline Park. Soar higher than ever before as you bounce across our patented, all-trampoline, walled playing courts. You can even play three-dimensional versions of your favorite sports, like dodgeball. The goal is to make your party as easy and seamless as possible so you and your guests can focus on fun. Sky Zone offers one standard package, but every party is completely customizable to your requirements. It is your party, after all! Give Sky Zone a call and they’ll plan the best party ever!